Using a bucket buddy is highly recommendable when you’re dealing with buckets filled to the brim with heavy items. You don’t want to hurt your back after all, or discover that the steel handle is not as sturdy as you thought it was. One advantage the bucket buddy gives is that you can transport two buckets by yourself while keeping one hand free to do something else. 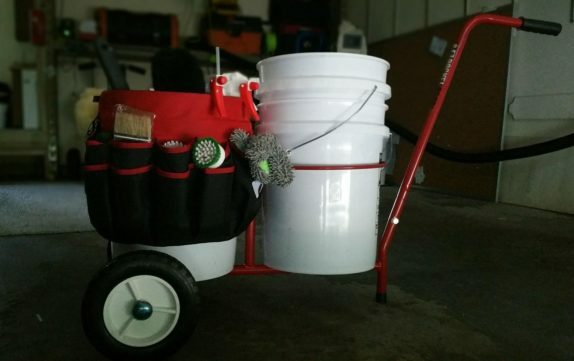 Its low cost ensures that if you regularly need to transport buckets, the bucket buddy is a must have. It has one main disadvantage unfortunately: It takes up quite a lot of space. In an ideal world the bucket buddy could be folded up, but the design doesn’t allow for that. Nonetheless, this is a product we would greatly recommend, especially as you can buy it with free shipping on Amazon. As mentioned earlier, if you’re interested in the bucket buddy, definitely check out our bucket dolly page too. You have the handle on the wrong end. It should be near the axle. When you tilt the handle back, the weight of the bucket is on the axle for better balance. You’re right about that, thanks for noticing. The handle is on the correct end, as this puts less load on the axle point, as the user is carrying part of the load. Having a ‘see-saw’ configuration puts double the bucket load on the axle point – the weight of the buckets, plus and equal amount of force from the user to tip them up. The balance of the device is better with the current configuration, hence why wheel barrows and air compressors both have their handles located as they do.